You can no longer search for guns or ammo on google shopping - Miata Turbo Forum - Boost cars, acquire cats. Type in something in and see for yourself. I'm less than thrilled with google right now. Have you been trolled, Hustler? I just googled for the first gun and ammo I thought of, no problems here. 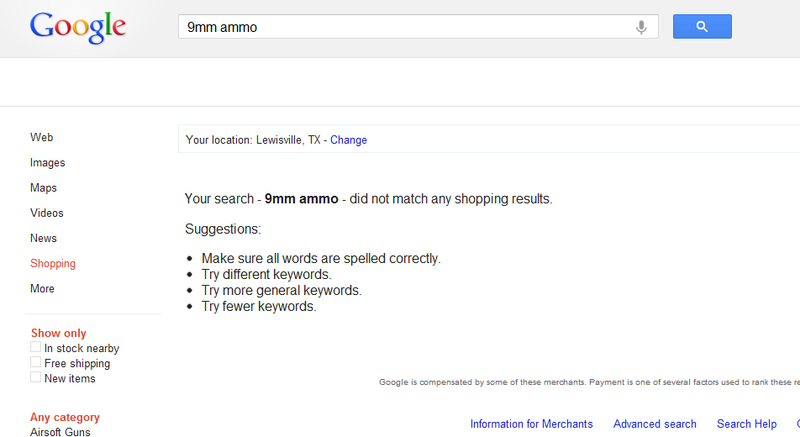 Thousands of results on google shopping here for 44 magnums, both guns and ammo. Google guns and ammo, no problem. Your link is dead. looks like google will soon be off my list of companies I support, that includes all my gmail accounts. So it looks like I'm switching to a Windows 8 phone the minute they come out. Goodbye google, we're through. No proxy or other server I can use is able to duplicate your claimed functionality, Hustler. 9mm ammo returns fine across half a dozen US states and another half dozen countries. I'd say perhaps it's state-specific laws related, but I have a proxy located in Florida that returns perfectly fine for me, and MD is also located there. It's on their policy page, dude. Looks like I'm done with Android. Buy an MSPNP Pro, you'll feel better. Did you read their own policy page, dude? It's for AdWords, not shopping. Either Google is slowly rolling out a ban on guns and ammo sales across the US (Plausible but hard to believe they'd implement something extremely piecemeal across a few very specific locations), or it's tied to specific ISPs/geolocations (Somewhat probable - I have a proxy located in FL that doesn't get the results MD claims to get, remember), or something is seriously borking (Most probable I'd say). ------- Hotmail..I don't know that I can bring myself to use it but I have to try. "AdWords" is Google Shopping now. "Piecemeal" implementation of socialism and protectionism is the MO of your party-o-commies. Then why in the world do I have no problem finding AK47s and ammunition on Google Shopping, Hustler? Secondly, since you went there - how is a private business deciding what is best for them and engaging in that not free market practice? If Google decides it is best for them to not allow people to sell guns on their site, well, isn't that the free market at work boo? /Yes, I just went there. I suppose they don't have their keyword list ready. Please show me a link to where I suggested a government entity force my will upon them. This is the beauty of the free market, I can take my keystrokes and money to Microsoft now. You are predisposed to ideas of government intervention. and as a free market practice, instead of us whining about it we are taking our money and digital data (in which they make money) elsewhere. whats so wrong with that? it was apparently put into effect today so the rest of you will probably see the results as it is rolled out acrossed google's infrastructure. Last edited by MD323; 07-01-2012 at 09:10 PM. You pretty clearly tried to paint a free market issue (I.e. google is, for whatever reasons they may have, possibly removing a subset of search results on a commercial service), as an issue of "your party-o-commies" bro. Apolitical, free market stance - "Let them, I'll take my money elsewhere." Political, let's-try-to-turn-it-into-politics-stance - "MO of your party-o-commies"
If you don't like the decision of a business, that's fine. There's lots of businesses whose decisions I don't like - but I also don't try to paint them as the MO of the right-wing authoritarian conservatives, do I? There's no legislation or otherwise government intervention that I am aware of that led to this result, and frankly I am as baffled as you are if Google really goes through with this. Restricting their shopping results like this is truly baffling for a commercial service. Everyone on planet Earth is aware that google is a private corporation, we didn't need you to remind us. We're also fully aware of the way free commerce works, and champion the concept. This is Miataturbo, we vote with our guns and wallet.